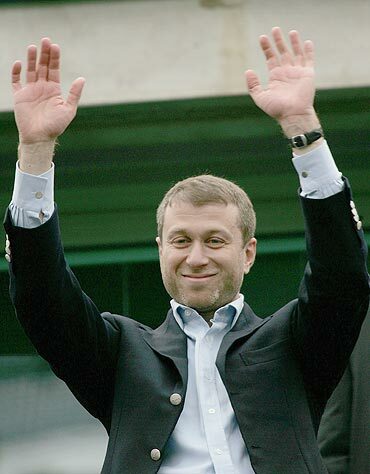 Since the billionaire from Russia took control of the London club in 2003, Claudio Ranieri, Jose Mourinho, Avram Grant, Luiz Felipe Scolari, Guus Hiddink and Carlo Ancelotti have all left Stamford Bridge after failing to reach the Holy Grail. Chelsea's latest quest for glory in the competition that Abramovich has spent hundreds of millions of pounds trying to win starts against Bayer Leverkusen at Stamford Bridge on Tuesday. With Valencia and Racing Genk making up the Group E quartet, Chelsea should have little trouble easing through to the knockout rounds of the competition. The only players still at the club who took part in Chelsea's first Champions League campaign when they reached the semi-final in 2003-4 are John Terry and Frank Lampard, and Lampard says past failures have only increased their desire to lift the trophy. "Obviously it is something the owner wants," he said. "When you have had a lot of domestic success, it's not just the owner, but the whole club and the fans who want that extra step -- to win in Europe. "As a club, with what we have achieved in the last six or seven years, it's an obvious thing to say, the one thing that is missing from our cabinet is the Champions League. "I wouldn't say that's the only reason the other managers have been sacked, but the pressure is cranked up regardless." 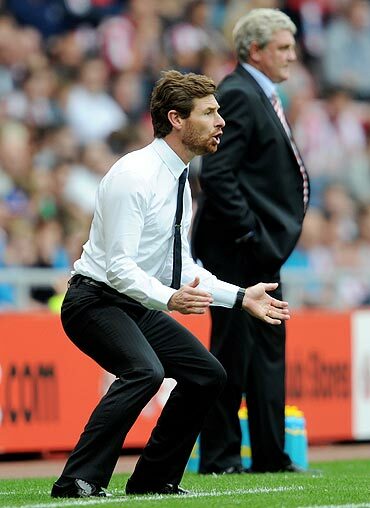 Villas-Boas is well prepared for it after becoming the youngest coach to win a European trophy when he lifted the Europa League with Porto last season. Chelsea have started the new season in good form under him and are undefeated with three wins and a draw from their opening four matches following Saturday's 2-1 victory at Sunderland. 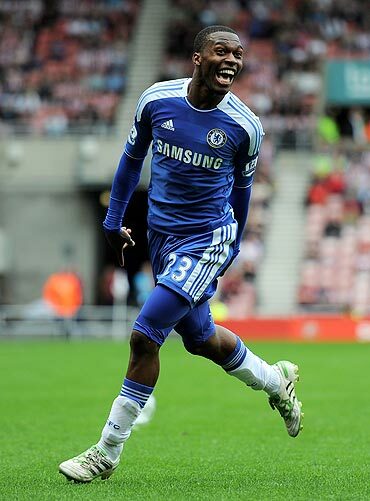 Striker Didier Drogba will miss Tuesday's match following his head injury and subsequent concussion against Norwich City two weeks ago, and with out-of-form Fernando Torres relegated to the bench on Saturday, Villas-Boas could well start with the youthful Daniel Sturridge alongside Nicolas Anelka up front. With new signings Juan Mata from Valencia and Raul Meireles from Liverpool strong additions to the squad, Chelsea look set to challenge until the later stages again and will be determined to improve on last season's quarter-final exit. They will also be hoping to welcome former midfielder Michael Ballack back to Stamford Bridge where the former Germany captain spent four years from 2006 to 2010. Lampard said he would get a great reception from the fans. "It's very nice he's coming back," he said. "He's held in very high respect at this club." Like Chelsea, beaten by Manchester United in the 2008 final, Leverkusen have also reached and lost one final, going down 2-1 to Real Madrid in Glasgow 10 seasons ago. The pressures on them are entirely different to those on Chelsea and Tuesday's match will be their first in the competition in seven years. They also go into it on a high after crushing Augsburg 4-1 on Friday. "Now we can go to London with a lot of confidence," said Sidney Sam, who scored twice in the game. "Chelsea is going to be a very tough opponent." Ballack will no doubt attract the spotlight against his old club and coach Robin Dutt will be happy to have him back fit and sharp, as he was against Augsburg, starting for the first time alongside captain Simon Rolfes in midfield. It is unclear, however, if Dutt will spring a similar surprise against Chelsea. 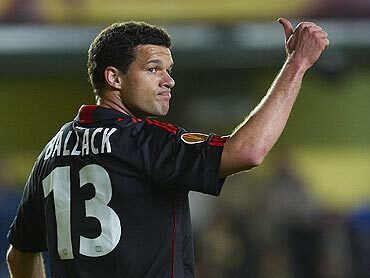 "I do not know yet whether he (Ballack) will play on Tuesday. We have a lot of fit players," Dutt told reporters. Germany international Andre Schuerrle is the most likely replacement for Ballack if he remains on the bench. Dutt will, however, use 19-year-old goalkeeper Bernd Leno, who has been outstanding so far this season as a replacement for injured Germany international Rene Adler.